The Rabble Hasn’t Been Roused Like This Since Nuremburg… | HAIL DUBYUS! I’m sure you’ve all seen the clips. 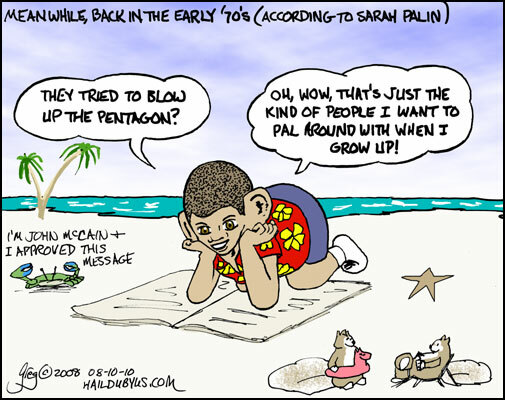 Sarah Palin at the rallies, misrepresenting Obama’s association with former Weatherman Underground member William Ayres, to cries of “Terrorist,” and “Kill him.” Does she stop and say, “Hey, none of that kind of talk”? Nuh-uh. It’s just what she wanted to elicit from the crowd. It’s what McCain wants her to elicit from the crowd. Kill him. If they weren’t running for President and Vice President themselves, they could be arrested for incitement to violence, because that’s exactly what they are doing. They’re trying to incite violent hatred against Obama–you know, “THAT ONE”–possibly enough to get people to patrol the polling places and issue challenges against black and Hispanic voters, trying to intimidate them. Maybe more. Hell, when Sarah Palin heard “kill him”, she had a chance to show her true mettle. And she did. She let it ride. Are they trying to get Obama assassinated before November 4? It sure as hell looks like it. Maybe that’s the only way McCain thinks he can win.